Mark Massara grew up in Santa Barbara, California and attended the University of California San Diego, graduating in 1984. Massara attended University of San Francisco School of Law (USF) where he continued a lifelong commitment to assisting nonprofit organizations and community groups in efforts to protect coastal resources. In 1985 he worked with the Santa Barbara Environmental Defense Center (EDC), and in 1988 following law school he became General Counsel of Surfrider Foundation. By 1991 Massara had concluded prosecution of the largest Clean Water Act enforcement case in US history, involving two pulp mills in Humboldt County in a case documenting over 40,000 violations of the Act. In 1992 Massara founded Surfers Environmental Alliance (SEA) and later established the National Association of Surfing Attorneys (NASA). In 1998 he partnered with Kenneth and Gabrielle Adelman to create the California Coastal Records Project, an educational project including nearly 80,000 photographs of the entire California coastline. Massara has also served on the board of directors of Vote the Coast, the California Coastal Protection Network, Save the Waves Coalition, Project Kaisei, and CoastWalk/California Coastal Trails Association. Presently Massara serves as President and as a board member of Oceans4All, an ocean resources education initiative, and a supporter of the O’Neill Sea Odyssey (OSO), a nonprofit youth marine education organization. In 1992 Massara began an 18 year long association with Sierra Club as Director of the Club’s California Coastal Programs. Since 2009 Massara has served as General Counsel of O’Neill Wetsuits, the worlds largest manufacturer and distributor of fine quality surfing and dive wetsuits and sun protection lycra products. Massara writes extensively on coastal and environmental legal issues for news and surfing periodicals, and has lectured widely and taught ocean law, policy & science at Stanford Law School and other colleges and universities. When the California Coastal Commission held hearings in 1998 on whether to approve a Hearst Corporation proposal to build a series of resorts on one of the last untouched stretches of coastline, Massara and Sierra Club organized a crowd of 1,500 to show up. In April 2007, Massara and Sierra Club led a coalition of dozens of environmental organizations and thousands of coastal activists in the defeat of a multi-billion dollar proposal by BHP Billiton to construct a 14-story liquid natural gas terminal that would have been a floating toxic industrial hot spot several miles off the Malibu-Oxnard coastal area of Southern California. The victory, in which both the California State Lands Commission and the California Coastal Commission denied the project in separate hearings, is considered the Waterloo for LNG terminals along the California coast. 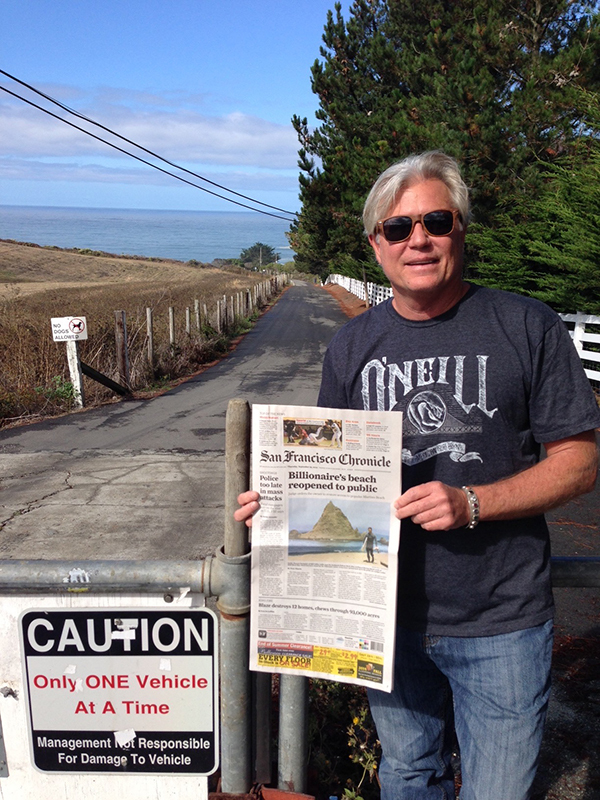 In 2014 Massara organized a legal dream team of some of the nation’s most celebrated lawyers (including Joe Cotchett & Pete McCloskey of Cotchett, Pitre & McCarthey) to represent Surfrider Foundation in a Coastal Act violations case against Silicon Valley billionaire Vinod Khosla, who had purchased Martin’s Beach along the San Mateo County coastline below the City of Half Moon Bay, and subsequently eliminated century old public beach access rights. Following a trial during the summer of 2014 the Court has found Khosla in violation of the Coastal Act and ordered Khosla to allow public access to Martin’s Beach. The case has been memorialized in a leading California Court of Appeals decision (read Certified Published Decision of the California State Appeals Court here). Currently, Massara focuses on climate change related coastal protection and land use issues. With a predicted 4.5-foot (1.4 m) sea level rise along the California coast in the next 80 years, Massara states, “There is no time to waste in implementing sustainable land use measures, resiliency strategies and habitat and wetlands protection measures.” Massara is urging private property owners along the coast to adopt “managed retreat strategies” wherever feasible and to include public and natural resource benefits in all protective measures. Recently Massara has represented farmers and agricultural property owners, nonprofit and preservation organizations and local governments in efforts to update local coastal planning documents, and public and private businesses and entities in obtaining permits for development, conservation, agricultural, residential and commercial development projects. Don’t hesitate to contact us if we can assist you with your efforts.